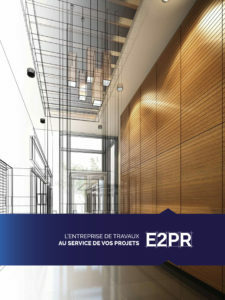 The publisher of the www.e2pr.fr website is E2PR, a limited liability company with registered capital of €10,000 entered in the Paris company register under number 751 351 438. Its registered office is at 4, rue Aminata Traoré, 94460 Valenton. E2PR provides construction services ranging from preliminary studies and analysis to project design, programming and all aspects of construction. The website is hosted by OVH, a company with an address at 2 rue Kellermann – 59100 Roubaix. All components of the website, and most notably its structure, editorial content, texts, illustrations, photograph and images, sound and video recordings, etc. are protected as intellectual property for France and/or the whole world. Furthermore, it is recalled here that the corporate name “E2PR” and its slogan and logo are registered trademarks. As a consequence, none of these items may be used or distributed in any form or manner without the express prior consent of Newords, to be given in writing. In the absence of prior, express consent given in writing by E2PR and/or any other third-party rights holder, all other uses and reproduction in whole or in part of the aforementioned website components constitute an infringement of, and are subject to penalties under intellectual property law. As a consequence, users undertake generally to respect the intellectual property rights attaching to the various items of content proposed as part of the Service, E2PR having no liability whatsoever for illegal use of such content made available to users by Newords via this website. imitation of the website other than for private purposes. E2PR may be led to disclose any and all content and/or information in order to comply with applicable laws or where Newords considers in good faith that such a step is necessary, such as in connection with court proceedings, most notably in response to complaints and/or claims founded on allegations of infringement of third-party rights, in order to protect the rights and interests of E2PR. This website may contain links to other third-party websites. E2PR declines all liability for damage, of any kind whatsoever, that the content of these third-party sites may cause. Providing links does not generate any obligation for E2PR, which has no control over third-party sites. Accordingly, E2PR cannot be held liable for links included in this website and the content of third-party websites to which said links refer.